It's here!!! I am SO excited to share our children's art space for many reasons. This creative room is such a labour of love and really has taken way too long to complete as clients always come before my own home. I'm sure I started telling you this post was going to happen two years ago! Although it has been one of the most used spaces in our house over the last 18+ months, it has not been ready to photograph or share in a styled way until now! The idea for this room started when my husband broke his hip (freak casual bike accident) and I knew we'd be home more than usual. I started scrolling other art rooms and saving my favourite art room ideas on Pinterest. All three of our kids love creating...drawing, painting, building, pasting, imagining, designing, etc. and after our dining table started to be constantly full of art supplies, I began thinking of an alternate space we could use. This space is different than most I share as it is a rough place in our basement that we literally scraped together to give the kids somewhere to make a mess, create in whatever way they want, explore different materials, textures and give their brains a place that they can come when they first wake up or when they get home from school or when they feel they need some time away that is different than anywhere else. I grew up creating, drawing, painting, sewing, making things whenever I could and I dreamed of having a space in our home for our kids to do the same. When we started, this room was literally full of boxes and the space we would just throw stuff to be sorted later (we don't have a garage) but realistically we needed to deal with the junk and use the space. Once the boxes were removed, we had drywall put up and lighting installed. I painted the entire space in Simply White by Benjamin Moore and then the rest was decor. I used porch and floor enamel to paint the concrete floor and although the entire space is still pretty rough, it is totally fine if paint drips, glitter drops, etc. I quickly painted the floor before photographing this room to make it bright and fresh again, but day to day, it isn't quite like this. 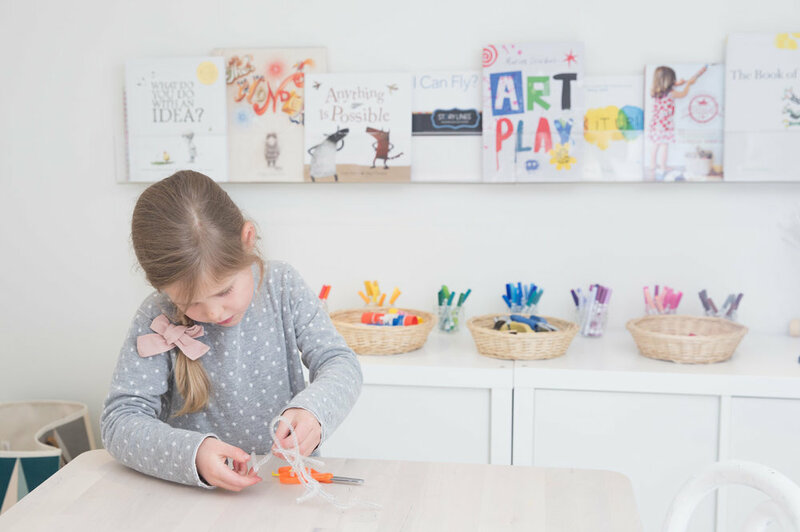 I didn't need this room to be perfect; I wanted the kids to be able to be free to explore in here, to get the paint out for themselves and learn how to take, use and put away materials on their own. The only way to learn is to practice, right? 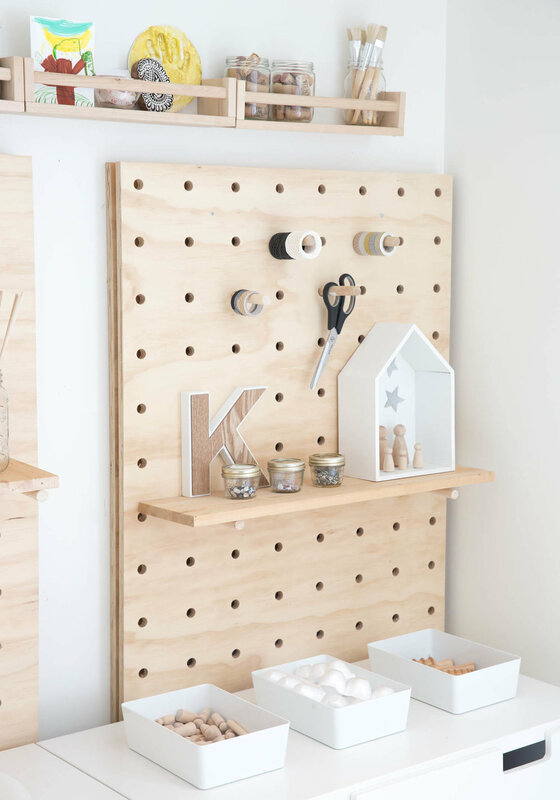 The side of the wall with the paint easels was so bare so we added these cute irregular dot decals in light grey to add a little interest. They are fun and the kids love them! We use old t-shirts as paint smocks, small jars for paint and large clothes pegs to hang wet art. It's not fancy, but it works! I love how focused and involved the kids are when they are here. The hours of conversation, creations that they come up with and frustrations that turn into proud moments are just a snapshot of what happens in an art space for kids. These three negotiate in here, have another way to release emotion, and show determination with projects that carry on for days. Creating a space for kids to let their creative side run wild is so worth it! 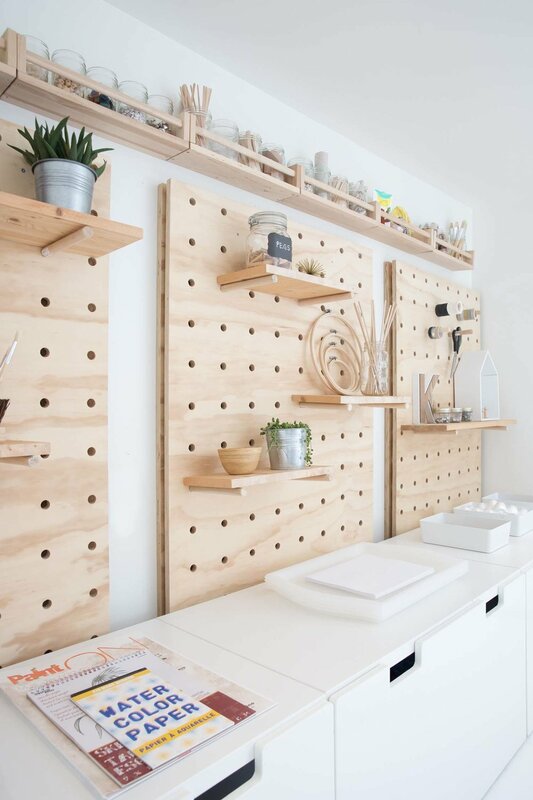 I love how so many of the little details turned out but am definitely most proud of the pegboard wall!!! I could use one in every room. Having everything accessible is great and items, such as the dustpan and brush, at a low height allows an opportunity for the kids to access things easily and help with cleanup. It's been such a long time coming and it's finally here...I'd love to know what you think!!! *A huge thank you to my sister Amanda from Amanda Haddow Photography for photographing this space.